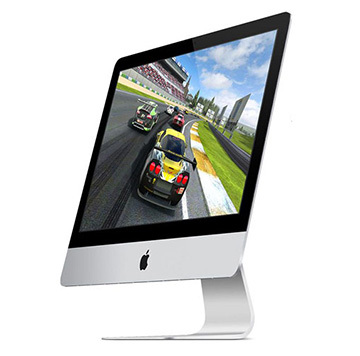 This iMac Core i7 3.6 GHz 21.5-Inch (Mid 2017) is powered by a 14 nm Kaby Lake Quad Core 3.6 GHz Intel 'Core i7' 7700 processor with an 8MB shared level 3 cache. This model sports dedicated Graphics thanks to a Radeon Pro 55 or 560 graphics processor (as ordered) with 4GB VRAM. Base configuration comes with 8GB DDR4-2133 (PC4-17000) SDRAM (difficult to access to upgrade), with 16GB possible at the time of order. The system, however, will in fact support 32GB supplied by 3rd party vendors. Storages comes from a 5400 RPM 1TB hard drive, a "FaceTime HD" webcam and stereo speakers with no optical drive.